I have been a user of the Direct Payments (DPS) system now for over 13 years and during this time I have had no less than seven different assistants. My longest standing assistant however has actually been with me for 15 years and her daughter also worked with me for over 13 years until she sadly passed away, you’ll see a reference to my dear friend Bernadette in her mother’s written piece later. At this time I have four assistants working for me, Carol has been here for 15 years and Sue has been here for 8 years. The later arrivals, the “newbies” are Mel who has been here around 3 years and Sasha who has been here just about eighteen months. I am very lucky to have such a terrific team of people around me who enable me to do what any normal person would be able to do when running their home. I have also been lucky enough with all my assistants as have supported and me helped with my older children and also their children. When my dad was diagnosed with terminal cancer a few years ago all my assistants stepped up to help look after him as well. He came to live in my house for a while whilst adaptations including a walk-in shower were fitted to their bathroom at home. This is what anyone would do with a parent and having him at home with me allowed him to have the use of my already adapted home until his was made suitable for him. Here are the testimonials from my assistants. The last one is a combined testimonial, Mel and Sasha are mother and daughter, the mum came first 3 years ago and then suggested her daughter came in as well when I was looking for another assistant. My name is Carol Filer, I started working for Mandy as a P.A. (cleaner) on Thursday 26th of June 2003. Mandy has always been a very good employer – she’s kind, thoughtful and has a wonderful sense of humour and we have become friends over the years. My daughter Bernadette also became a P.A. to Mandy a few years later, going to functions and events and also became very good friends, always lots of fun and laughter. 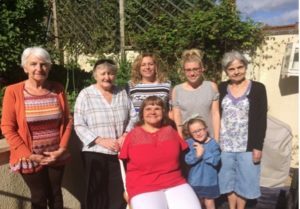 Sadly Bernadette passed away in September 2016, Mandy was devastated and Bernadette cried over the thought of leaving Mandy – they had a really special friendship, this between employee and employer. This is how Mandy is, a very special lady. Mandy, AKA the mad cat woman! Working for Mandy. It’s like going to your friend every day and just helping her out. Over breakfast we chat, we discuss, we put the world to right, we laugh, we think of ones we have lost, we discuss our ailments and kids – we always discuss our kids! While all the chatting is going on I do what I have to do! Really its “home from home”. Mandy has a lovely team of helpers, head of these is her mum Wendy who is so helpful, when anyone is ill or on holiday she readily steps in. What’s rewarding about the job? Everything really. I’ve learnt to tolerate cats, I’m a dog person at heart, but Jake, one of Mandy’s cats is so nice, especially now he’s given up his bird killing ways! I now know about blushes, lipsticks, eye shadows and all that makes Mandy beautiful! and trust me it takes a lot! “only kidding Mand” I’ve looked after her lovely dog Jack and Wendy’s rescue dog Cleo. I’ve always known that even if you have a disability you can still do and be whatever you want to be and Mandy is absolute proof that this is so. There are no negatives, except for perhaps entering the pit on the other side of the landing where the creatures called TEENAGERS live. I think of Mandy as a friend first and my employer second, I always look forward to our daily discussions and her ability to remember the places, people, dates etc that I’ve told her about and I’ve forgotten! Mandy is a very lovely woman to work for and is a very fair boss. As personal assistants we have built up a lovely friendship with Mandy. It’s not just a work thing anymore, we like to socialise with her out of work hours as well. We have all gone out on birthday celebrations and had numerous candle parties. We do all sorts of stuff, we do Mandy’s hair and make-up and even had the luxury of plucking Mandy’s nose hairs – who else can say they get such work diversification?! We carry out many household duties such as, cleaning, washing, ironing and even bed-making. We get to go out on jollies as well taking Mandy shopping and to doctors or hospital appointments, one week we could be off to the physio and the next it could be to get her nails done, such variety. We really do enjoy our most rewarding job.